Beautiful outdoor living spaces. Dimensions for Scottsdale - Phoenix lifestyles. Will it be pavers, tile or natural stone? Unless its your driveway – pavers are just the beginning of stylish surfaces you can use in your Scottsdale or Phoenix landscaping. This gives you awesome flexibility for the landscape design in different parts of the yard, not to mention obtaining better visual flow between interior floors and the extending outdoor spaces. It doesn’t matter whether its the patio just outside the kitchen and family room or your front entry courtyard, there should be some relationship between your indoor flooring and those that have traffic flow through the doors. With so many choices of colors and styles available to the Valley homeowner, you’ve got it much easier than people who live in other areas of the country to maintain great style. Visit our Pavers Portfolio for more examples of our paving work. Standard or travertine pavers, Phoenix? You just can’t beat the look of patio pavers and travertine pavers in your outdoor living spaces. Both give you a sound investment and timeless beauty that is an asset every way you look at it. 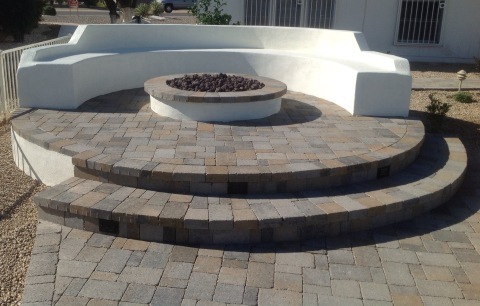 If its a large space and your budget is a bit limited, regular Belgard or Phoenix pavers will probably be your best bet. If you’ve got a little more room to play with expense-wise, the obvious choice is going to be travertine patio pavers, which are also just as wonderful for pool decks. One thing is certain, you’ll be happier with the new flooring outdoors if it has some variation in color. A solid colored paver, once installed, can be just too much repetition – especially over a large area. Paver patio designs and pool decks give your personal spaces options in the variety of patterns for installation that are available. The most popular choice in both Phoenix and Scottsdale is tumbled styles as they give you more of a ageless, natural stone feeling as opposed to the sharp cornered lines of smoother brick pavers. While dark colors appear to offer you dramatic design effects, its a poor choice for spring and summer months here when the sun is so hot and intense. Keep it light and add your drama with other landscaping elements and your outdoor furniture. You’ll find a good number of patio and courtyard designs that make lovely use of this type of stone paving around the Valley. The irregularity of shape and the natural colors add a note to the styling of any space not possible with any other material. At times, this is even used for the front sidewalk, which definitely gives your wonderful flow from the curb to your front door, a design factor that gains a lot of emphasis when it leads to a courtyard design treated with the same flagstone paving. There are other types of stone paving available. Flagstone is usually the most free-form, but many other kinds of stone are available in square or rectangular forms. Some of them are very formal looking and others could give you a more relaxed formal air as easily as it could be perfect in a more rustic setting. It all depends on the installation pattern and the surrounding landscape design as well as the architecture and details of your home. Rosa, Buff, Buckskin, Tan, Golden Buff, Sunburst, Classic Oak, Pueblo, Buckskin, Sedona Red, Golden Buckskin, Milk Chocolate.